Rubidia is a tenacious and hardworking woman who has overcome many obstacles in her life to become a powerful woman in El Salvador. 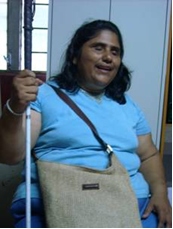 Rubidia works for the Association of Blind People (ASCES), and is President of the Association of Blind Women (AMUCES). This association gives blind women, in particular from rural areas, the opportunity to meet, organise, and make demands of the state. She has worked on women’s health and sexual education as areas of particular neglect for blind women. Rubidia greets everyone with a beaming smile and energy that leaves you with the lasting impression that this is a woman who can – and is – changing the world. The International Convention on the Rights of Disabled Persona was ratified in El Salvador in 2008. It is estimated that only 20% of the blind population in the country are literate with the Braille system – as a result 80% of the population are excluded from fully participating. Having access to materials in Braille at school is something that significantly affects the ability of an individual to be independent later on in life, including making their own decisions about work, life and family.